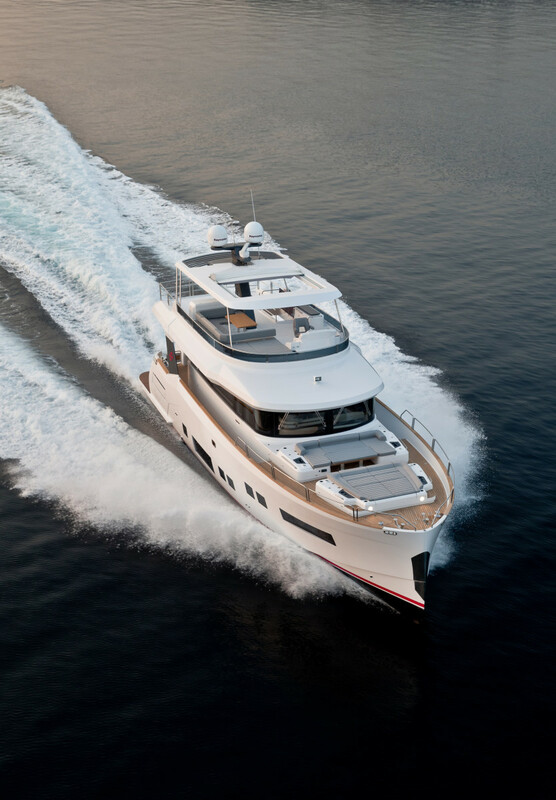 The Sirena 64 has megayacht-style features and a hull designed for economical and fast cruising. In Greek mythology, the Sirens were beautiful sea creatures who lured sailors with their enchanting charms. 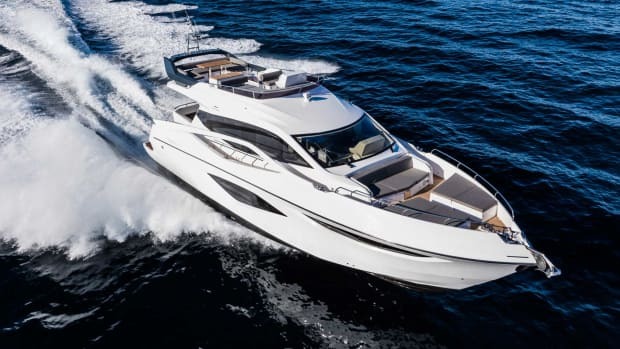 The Sirena 64 has exactly those qualities. Consider yourself warned. 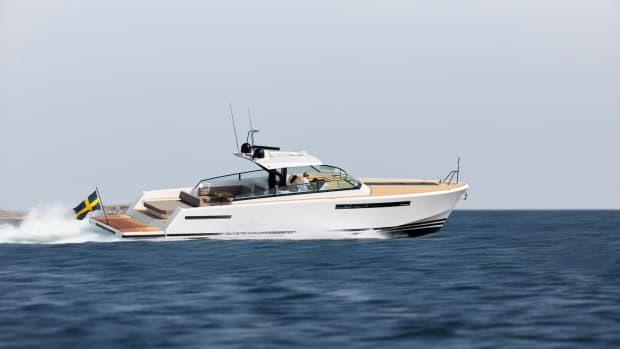 Turkish builder Sirena Yachts wanted a yacht capable of economical long-range cruising as well as sporty speeds. 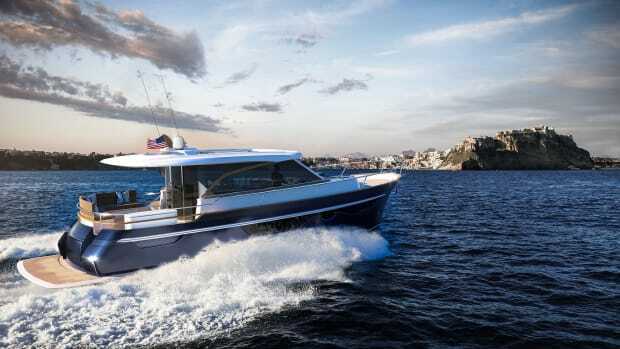 The dual-mode hull meets both requirements: a 10-knot cruising speed at 10 gallons per hour provides a 1,200-nautical-mile range plus a 28-knot top speed. 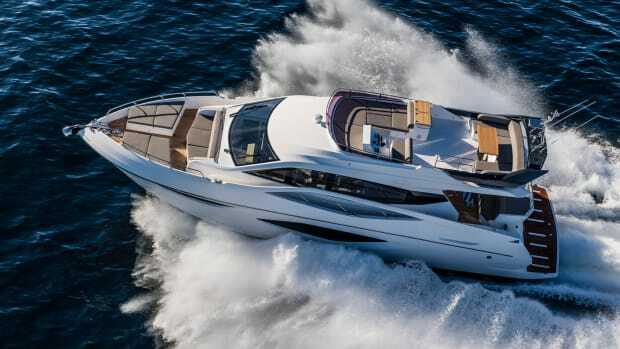 She has superyacht-style features, too, such as a hot tub with a couch, table and sunpads beneath an awning. The full-beam master stateroom has 6 feet, 8 inches of headroom; its king-size berth has a buttery-soft Italian leather headboard; and its bathroom spans the beam with a double-wide vessel sink, a head with bidet, and a shower with seating for two. The full-beam master stateroom has a buttery-soft Italian leather headboard and 6 feet, 8 inches of headroom. The VIP stateroom forward has an island king berth and ensuite head. Also off the lower foyer is a third ensuite guest stateroom, this one with twin berths. A day head is behind a foyer door. The salon has a dining area with seating for six opposite a semi-enclosed galley. 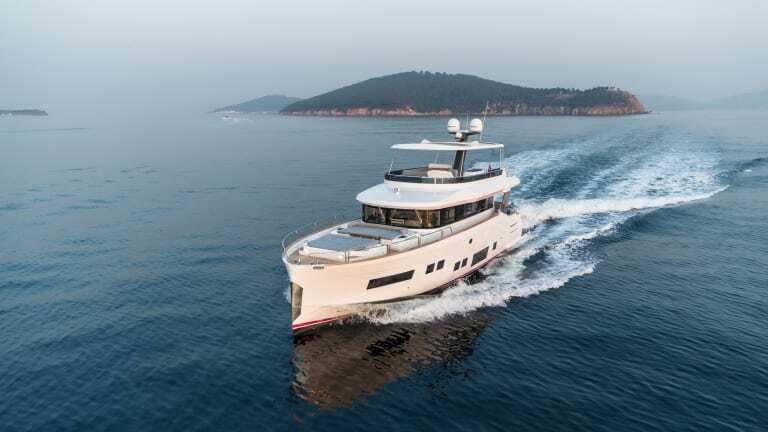 A glass panel aft separates the galley from the twin couches in the living area, and a removable frosted panel on the inboard side can hide the galley, which has an opening window, a Miele fridge and an induction three-burner cooktop with oven. 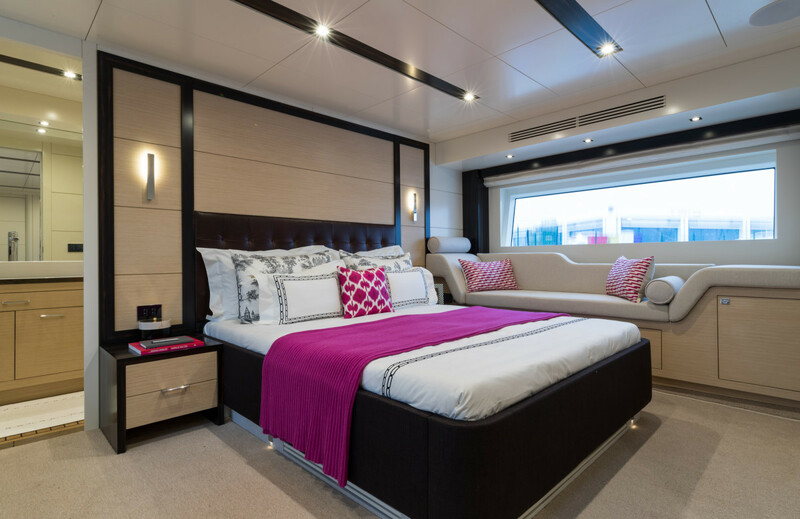 Large rectangular windows and an uncluttered layout give the Sirena 64’s symmetrical salon the ambience of a bright, open penthouse. The lower helm is forward of the galley, giving it some protection from the goings-on aft. A love seat next to the helm with mini-table allows the skipper to have a companion. 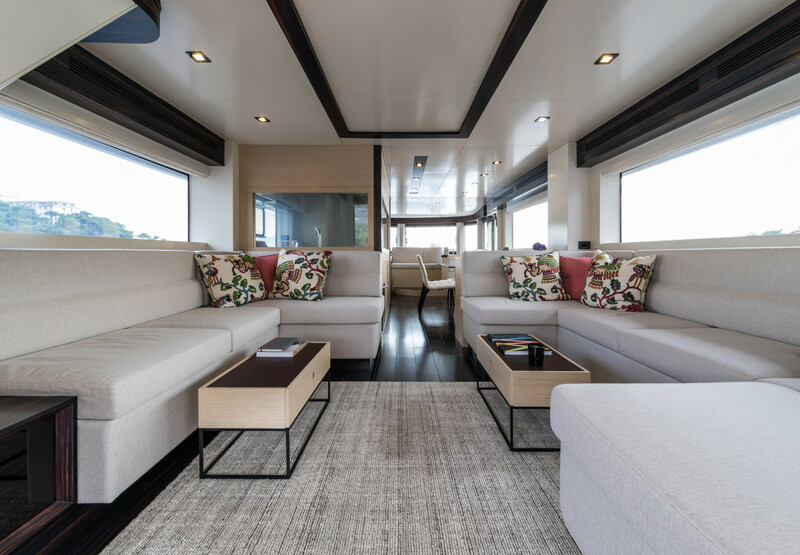 The flybridge, which extends over the side decks (providing shade for the salon windows) is another surprise for a 64-footer, with a settee and table opposite a console that has a swing-out counter for buffet service. 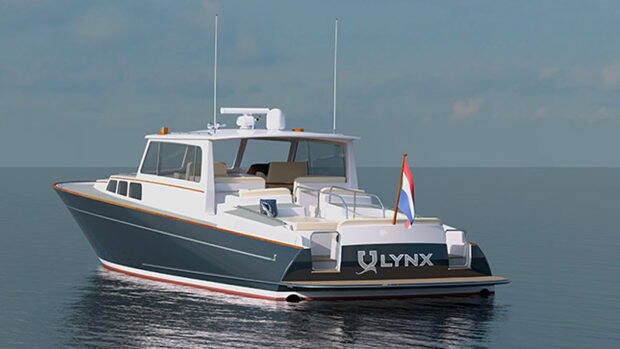 The helm has twin Stidd seats and a lordly view of the world, and a sunpad opposite. A fiberglass hardtop with an opening sunroof covers this whole area. 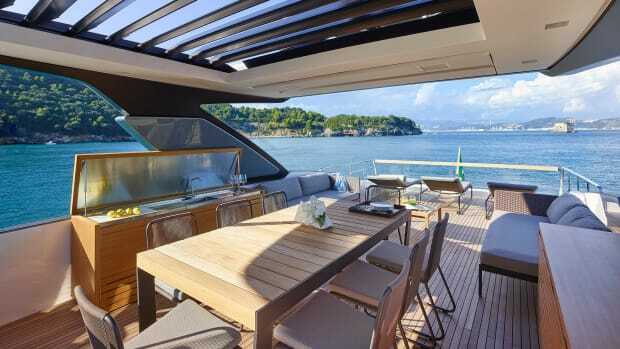 The flybridge deck aft can handle four teak-and-canvas sun lounges and still leave space for a sink, grill and fridge. 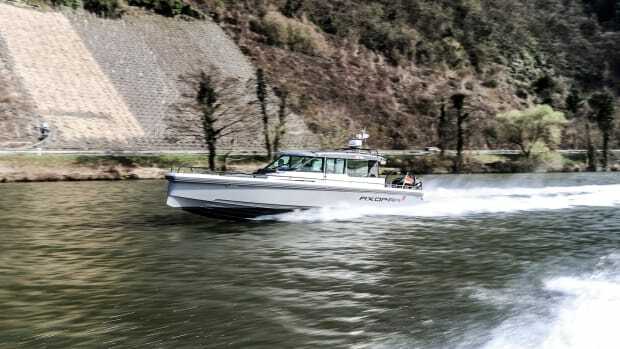 Standard power for the Sirena 64 is a pair of 850-horsepower Caterpillar C12.9 diesels (1,000-horsepower Cats are optional) plus twin 21.5 kW Onan generators. 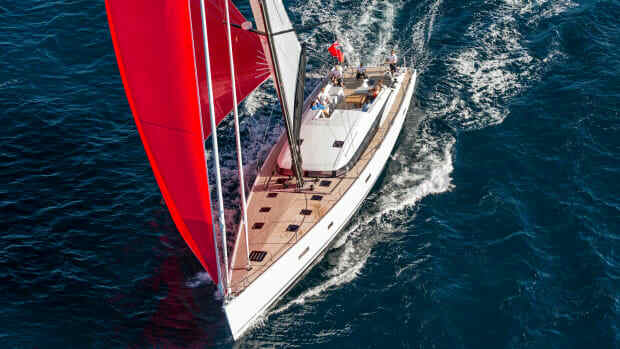 The Sirena 64 can be owner-operated, and she has a crew cabin abaft the engineroom with a single berth and head/shower. 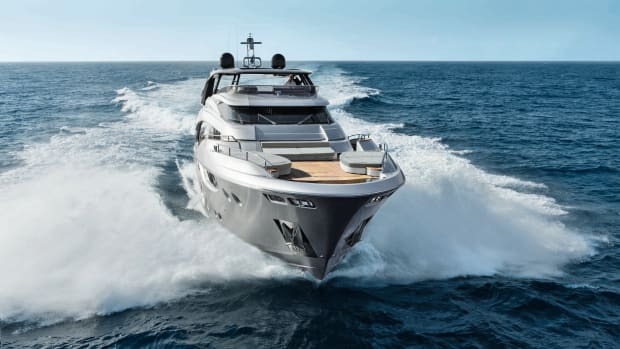 From the standard hydraulic transom platform to the fit and finish of the wengé and ebony interior, the Sirena 64 has surprising megayacht style.